Nine years after the theatrical release of the final installment of the Lord of the Rings trilogy, director Peter Jackson brings us back to the Shire, back to Bilbo Baggins, and back 60 years to a more peaceful time in Middle Earth. Using J.R.R. Tolkien’s The Hobbit as the launching place for his The Hobbit: An Unexpected Journey, Jackson carries us through the first part of the treasured novel with quite a few twists of his own. I hadn’t paid enough attention to the marketing machine to notice that the relatively small novel had been set up as another three film franchise, but, after all, with the wild success of the first trilogy, why not make a series? Also, having read The Hobbit recently, I can see why it makes sense to break the journey into three neater pieces instead of smashing every dwarf into the background just to get through the plot. About the tale itself: if you’ve seen the Lord of the Rings films, you are set to understand every scene and most every character introduced. If, somehow, you missed the Lord of the Rings, but read The Hobbit, you’re going to be confused by the introduction of an evil albino Orc, a strange brown wizard, and some Elvish-Dwarf drama that is not pronounced in the book. Jackson and his writing team also pour on an opening scene featuring Frodo right before his Lord of the Rings quest, a longish introduction scene that is perhaps a nod to the fans to make them feel at home. Most of the elements added to the movie serve the purpose of setting up the ominous spread of darkness that eventually translates to the necessity for the Lord of the Rings events 60 years later. These additions dampen the lightheartedness of the Hobbit’s tale a little, but carefully timed wit by some skilled actors keep the tenor relatively bright. Ian McKellen reprises his role as Gandalf, who is a bit of a confusing wizard, but nice to have around when trouble strikes. 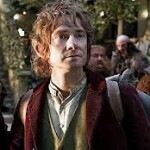 Martin Freeman comes on as the young Bilbo Baggins. Freeman really brings the humor to the tale, whether facing a horde of uninvited dwarves or a tricky Gollum. Relative newcomer Richard Armitage commands the screen as Thorin Oakenshield, the dwarf king whose mountain homeland was taken over by the gargantuan dragon Smaug. And yes, he can command the screen even though he is a dwarf. On the whole, The Hobbit: An Unexpected Journey clearly reads as a set up for the next two movies, and it plainly incorporates the same themes present in the Lord of the Rings films. The visual effects are fantastic, and by fantastic I mean sometimes horrifically grotesque, sometimes surreally gorgeous. If you have any inclination to enjoy fantasy writing translated vividly to screen, then by all means join the masses and see The Hobbit. It is a rather nice beginning to an adventure. The Hobbit entered into the entertainment world with extremely high standards after The Lord Of The Rings trilogy blew everyone away. I agree that the visual effects of The Hobbit are outstanding, and that they do a good job at making it pretty light hearted and witty, but almost to a fault. I know that the Middle Earth in The Hobbit is a much more peaceful and happy place than the one in Lord Of The Rings, but I didn’t really feel any connection between the two. I went into the movie feeling excited to be revisiting my home in Lord of The Rings, but went through the whole movie never feeling the satisfaction and comfort of being back in Middle Earth. The movie overall was entertaining, but felt almost a little too silly at parts. Much sillier than you would ever expect to see in Middle Earth. Some parts of the movie just seemed a bit off and did not really fit. I do agree that The Hobbit was a good setup for the trilogy, but it was no where as epic as Lord Of The Rings. I believe that The Hobbit just can not really be compared to The Lord Of The Rings because it in no way is on the same level. Just considering The Hobbit by itself it is a decent and entertaining movie, but compared to The Lord Of The Rings it is a bit lame. I took my family to see this at the Fremont recently… Now, I am not a 3D movie fan by any means (too cheap, too gimicky, etc). I have to say two things: 1) This movie was AWESOME! I loved the Hobbit (book) more than the Lord of the Rings (LotR books), and while there were a lot of added Hollywoodisms (and nerfing of the Christian themes that Tolken was all about) it was still a very well done film! 2) The HFR made the 3D quite bearable! It did make it seem like a HD Satellite/Cable channel – or like one of those “Making of…” specials where you see the filming OF the filming, and it’s super sharp and clear and doesn’t look “movie soft” – that did take some getting used to. Overall, it was a great film experience to see in a theater – even if one is squeezed into the “coach flight” Fremont to see it. A very good review about the film portrayal of the Hobbit. If you enjoyed the book, you will be amazed at the rich texture provided by breaking the story into three parts; there is time to actually tell the story. And the detail using the new 48 frames per second recording method makes the visual depiction beyond stunning in 3-D. The Hobbit, an Unexpected Journey, is one film that should bring people back into theaters to see something on the BIG screen that really can not be experienced any other way.